Solo and from the sidelines, Nicole Tsong absorbs the basics — and the fun, social vibe. THE SKIRTS WERE the first clue that this was a night out. Several women wore skirts with extra bounce and flounce; silver and red petticoats winked underneath. Sometimes, their partners wore matching colors. 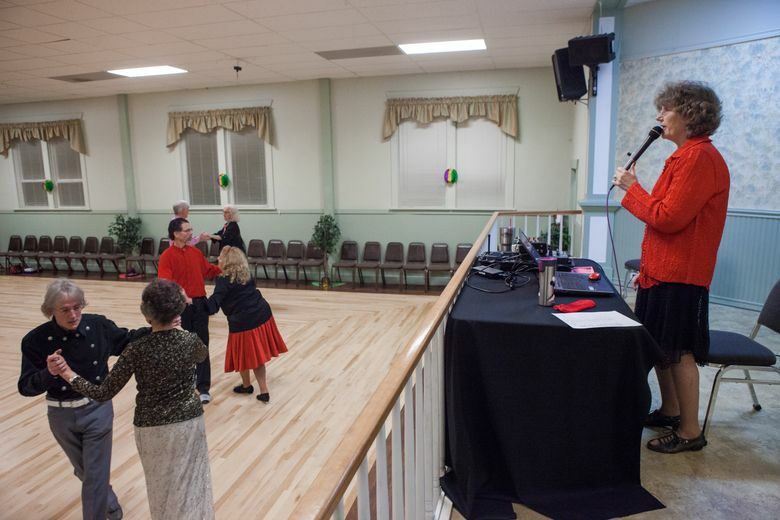 I was at Juanita Community Club in Kirkland on a Saturday night for round dancing with the Dancing Shadows club. Callers and instructors milled about with regular dancers and joined them on the floor. When cuer Debbie Taylor got on the microphone and started calling for the first dance, couples fell into formation and started to execute dance steps. From the sidelines, I marveled at how their steps flowed together. They were simple on their own, but the dancers could listen to Taylor’s constant stream of cues and string them together in the moment. It was beautiful to watch. Round dancing is a form of ballroom dancing. I had arrived solo, not realizing it required a partner (not that I had one who knew the steps). Taylor advised me to watch before jumping in another time. 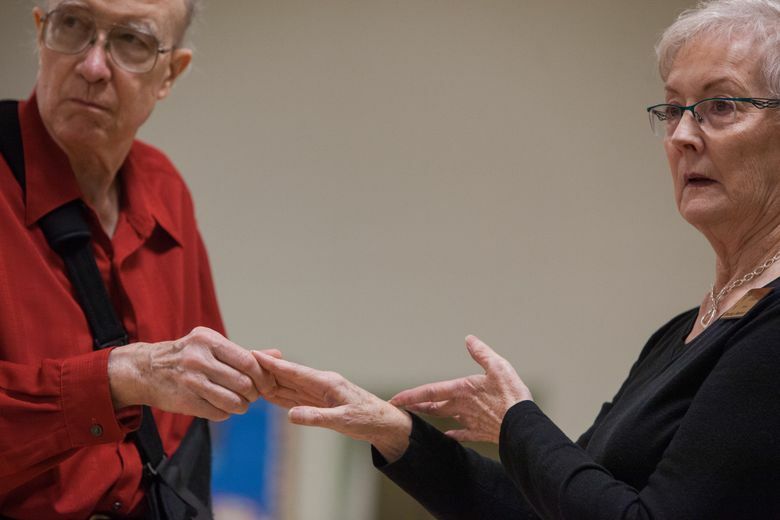 I was happy when Stephen Noseck, one of the dance organizers, explained more. 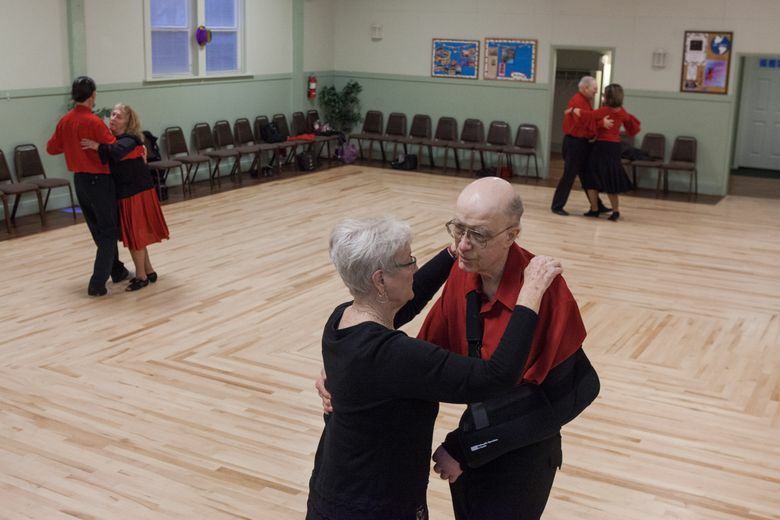 People learn to square dance first, he said, which allows dancers to come in as a single and learn the steps. Once you understand the cues and the timing, you can pick up round dancing. He explained the levels of challenge. Phase One or Two is a beginner dance, while Three/Four is intermediate, and Five/Six advanced. 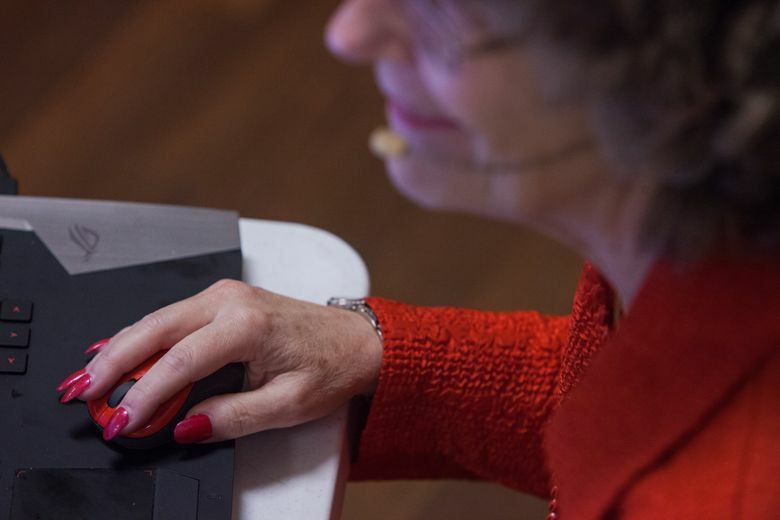 The degree of difficulty depends on everything from the entrance to the rhythm, or how the steps go together. I noticed right away that Phase Two/Three dances were generally more popular than Four/Five. 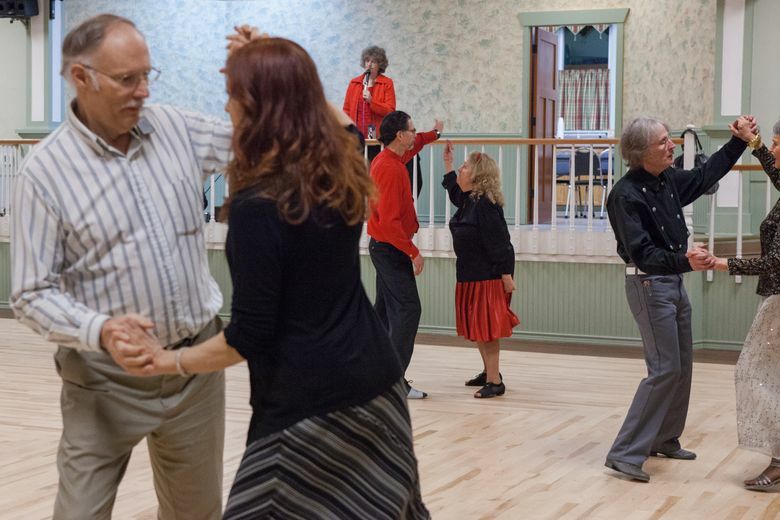 Round dancing includes several types of dance, including the two-step, the waltz, the cha-cha, the rumba, the fox trot and the jive. 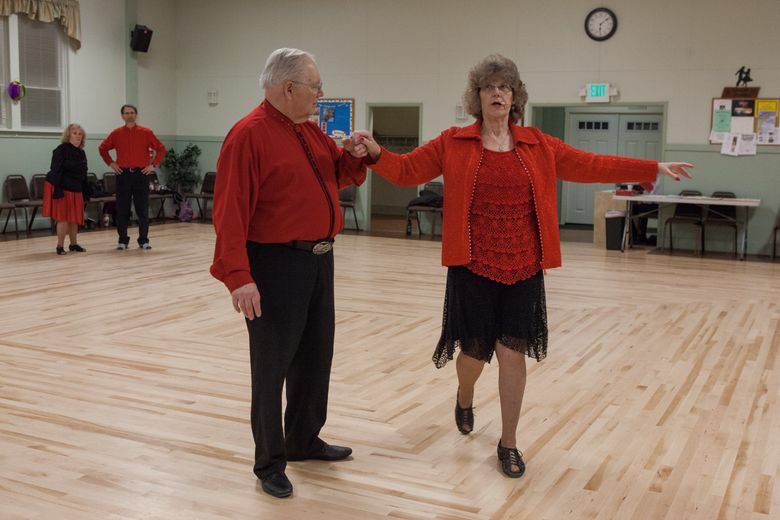 Unlike other styles of ballroom dance, where dancers decide how to put steps together, round dancing includes a cuer who directs you, part of the reason folks like it, Noseck said. You also can rest whenever you need to, allowing folks of all ages to dance at their own paces. I saw one man dancing with his arm in a sling. With this primer, I turned back to watch the dance. The floor had filled up, and a few teenagers had joined the group, rotating in a counterclockwise circle. They wore Puma and adidas sneakers, and jeans, though a few had skirts, minus the petticoats. With more folks on the floor, not everyone knew all the steps. I was starting to understand some cues, like “solo turn to butterfly,” though I had no idea what a “telemark to semi” was. Some dances ended with “reward,” and a few couples would kiss. Others would high-five. This evening was split between round and square dancing. More people arrived as the evening wore on; many chatted on the sidelines. When the program switched to square dancing, almost everyone who had been sitting popped up and formed squares of eight. The energy ramped up, and people were soon swinging partners and circling around in familiar formations. I appreciate a world where dressing up to dance on a Saturday night is the way you socialize. Couples and families came, some from as far away as Canada. People also wore badges of their names and dance clubs. There was no food or drink; people chatted and caught up in between dancing, or welcomed newcomers. They talked about people they knew from the dance world. They watched. More often than not, they got up, and they danced. Nicole Tsong teaches yoga at studios around Seattle. Learn more or reach her at nicoletsong.com.